Building a great website for your handmade business doesn’t need to be confusing and hard. This eBook will show you the secret to choosing the features your handmade business needs without being overwhelmed by what others are trying to sell you. This is a different type of book about websites. It’s not a technical guide that will take you through the step-by-step process of setting up your website. 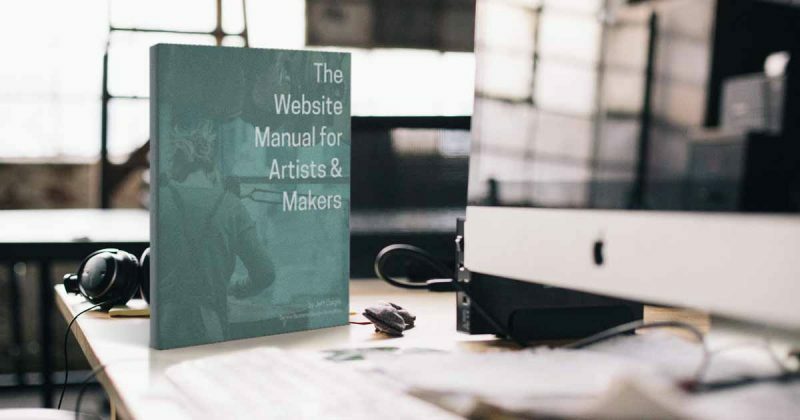 Instead, what The Website Manual for Artists and Makers sets out to do is give you the knowledge to decide what your business needs, and then find the right person, platform, and service to build the best ecommerce website for handmade businesses. You don’t need to be an internet expert to get a great website for your art, craft, or handmade business. In fact, if you’re not an expert you have an advantage because you don’t have preconceived notions of what tools and platforms you should use. What you do need to be an expert in is your business and where you want to take it. This book will teach you to use your business expertise to answer questions like “Who should I hire to build my website?” and “Which platform will give me the best online store?” without getting bogged down in the technical details. You’ll be able see past the marketing, the clever product names, and the hype behind the latest new thing. Instead, you’ll have the confidence to choose what is right for your business based on how well the latest new thing meets your needs. Why did you start your business? What do you offer that nobody else does? Where do you want to take your business in the future? Chapter 2: Building Your Website: DIY or Hire a Pro? The explosion of DIY website services has caused many people to declare that website design is dead. But for most small businesses a little help an make a big difference in the quality and performance of their website. Learn the ways to tell if the website consultant you’re working with is starting from the right place, and the trick to getting the best possible website for your handmade business. Having a domain name helps you protect your brand, control your reputation, and improve your SEO. Learn why and how to get one of your own. Don’t get overwhelmed by feature lists and too-good-to-be-true prices. Make a shopping list of what a web host needs to provide and make them match it. Learn which eCommerce Platform is right for the stage your handmade business is in, and why. SEO demystified, from Content to Code to Keywords. Includes a bonus section on AdWords and Social Media advertising. I’m Jeff Daigle, and I’m the founder of Denver Business Design Consulting (dbdc). dbdc helps artists and makers grow their revenue while reducing their workload. dbdc is unique because we don’t just build you a website and store of your own—we partner with you to build your business strategy for your next phase of growth and draw a blueprint for achieving your goals. For over 20 years I’ve designed, built, and tested web sites, brands, databases, desktop & web apps, and buildings, and worked in industries including higher education, architecture firms, international software companies, and tech startups. I’m a member of the Academy of Handmade Artists and Supporters, and am a licensed Architect. Now, as a small business owner myself, my goal is to help artists, makers, and small businesses grow their revenue and achieve their dreams of making a living by doing what they love. What I hope you get from The Website Manual for Artists & Makers is a greater understanding both of what goes in to getting the right website for your business, and of what the right website for your business is. This book and the worksheets in it are designed to become your very own personal guide to finding the right people, products, and tools to deliver a website that supports your business’s goals. Enter your email address to get your copy today and to join the dbdc email newsletter. You’ll get a new article about growing your online business delivered to your inbox every week that will keep you inspired and informed. Get your FREE copy of The Website Manual for Artists & Makers today!